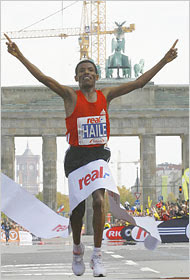 This is Haile at the Berlin Marathon 30 September 2007. He won. He won in 2:04:26, shaving 29 seconds off Paul Tergat's world record for 42.195 k. I was there. I didn't see him though. I was running with Sean again. "With" being an overstatement: we seldom stay together for long, usually because he hares off in front of me after the long pre-race negotiation of a race plan that involves a few miles together. We were also with Ian, a friend of Sean's from Long Eaton, who was allegedly starting in the pen behind us. We'd all suffered at London earlier this year. Today looked more promising. There'd be no exuses. Sean and I made it to our start pen about 5 mins before the starting gun. Just long enough to hear the strains of Chariots of Fire. Why, if endurance runners are so inured to pain, can you always rely on them to tear up when Vangelis plays those plaintive opening chords? The gun went off, Gebrselassie went off like a rocket, and the rest of us shuffled towards the start with the peoples of the world in front of us. How was the preparation? Perhaps not clockwork. As I've said earlier, I'd worried that I'd simply not put enough miles under my shoelaces. But then the speedwork had been great. I'd focussed on track sessions rather than the longer road intervals, and the race times (see below) had been promising. I thought things were really coming together just before the flight, when I weighed myself in at 157 pounds after lunch. 157 is good: not much excess baggage there. It may only have been a precursor to weighing the luggage (naked after lunch and a shower? ), but one gets sucked into reading the runes. Especially after reading an article about how tall people can't be great endurance runners. After that first 5k I settled into a steady pace. The course was still really crowded for the first hour, but it became possible to keep a constant leg turnover and head in a straight line. And this part of the course was quite pleasant, passing along the north side the Bundeskanzleramt and the Reichstag in a great big loop that would swing us clockwise around the city. Things got duller after that, passing through Fredrichshain and Kreuzberg. Even the course map couldn't find anything remotely interesting to identify on that 7k stretch. It has to be said that Berlin isn't the most attractive city in the world. But it's perhaps not the place of a Brit to say that. I'd been reading Max Sebald's On the Natural History of Destruction on the plane as part of my race preparation, to get me in the right mindset. Then into the depths of suburbia in Shoneberg. This was near where we were staying, with the family of a friend of Sean's. They were very splendid, gave us a great breakfast with acres of cereals, fruit, yoghurts, meat and cheese. And on Sunday afternoon we were fed Kaffee und Kuchen. But I'm getting ahead of myself. The crowd unexpectedly picked up in Shoneberg. We passed a samba band. And, outside a church, a line of girls dressed all in white, with blue ribbons. They were a little like the three groups of cheerleaders we passed on the route, but not quite. They weren't moving at all for a start. I raked my brains for bits of Luther that might help me, but couldn't find any. The bands in Berlin are great: mainly jazz, but plenty of drumming and some grungy rock. I was deeply grateful to them: it's hard playing to a transient audience. I passed a guy wearing a vest with a Welsh dragon design. "Bore da i chi," I called out. He grunted. He didn't seem to be enjoying himself enough. I passed a million Danish shirts, but I'd forgotten every word of Danish small-talk I once knew. So everything was going well. The 5k splits were looking fine, perhaps a little slow, but not too bad. The weather conditions were perfect: cool, and only a little wind now and again. The half went through in a little shy of 1:28, I thought. I just had to speed up a little and hold on, and I wasn't feeling too bad. But, I consoled myself, 3 hours would be just fine, wouldn't it, if it came to that? Or at least a new PB. Only another ... how long to go? I looked at my watch. It didn't seem to have a signal. This is not just any watch, of course, this is my beloved Garmin Forerunner 305, the GPS training device that accompanies me along the beaches of North Carolina, over the mountains of Virginia, and through the bitter fens of East Anglia, the same watch that ran out of power at the start of the New York Marathon. No signal. Then it started flashing, flickering between its various screens, blinking random numbers at me. My training partner was dead. After ten minutes I tried turning it off. It wouldn't turn off. I blame Mercury. Possessed by a spirit of madness L and I had acquired a dog three weeks earlier. 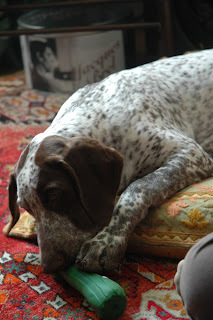 On the eve of the Cardiff 10k we'd found a four-month old German Shorthaired Pointer. Perhaps it was the good spirits associated with being a dog owner that had given me the fillip during the 10k. However, it also has drawbacks. Like having to stay up with him until he falls asleep. And the fact that if you leave the house for 15 minutes he'll get your Garmin down from the kitchen counter and chew it. Only now, doing an unknown pace around the streets of Berlin, did I realise that the hole in the back of the watch that I thought had been caused by the rough handling of my bag on the plane, had in fact been caused by puppy teeth. You can see him on the right. The Jacques Brel boxed set behind him has a song entitled 'Les Filles et les Chiens'. Regard it with caution. So where was I? 16 miles or 18? Was that 27 k I'd just passed? My heart sank when I saw the 25 k marker approaching. When was I going to hit the danger zone (18-22 miles: and what was that in k)? There was only one remedy left. Chin up, and run it with the heart. I tried again, and this time the watch went off. Focussing on my cadence I headed into Charlottenberg. The crowds were getting even better, and the course built a sense of expectation ... we were heading back into the city centre, and around Potsdamer Plaz the air grew electric. Passing people was no longer a matter of gliding past those who'd started too far forward, or went off to fast. These were runners struggling for times. They didn't want to be passed. These were proud people. At 37 k the end was in their mind's eye. On Potsdamer Strasse I was already thinking about a massage and a shower. And it was beginning to hurt. My right calf began to show the fore-signs of cramp. My breathing grew tense. We hit a couple of right angle turns and the acceleration was getting harder. At 40 k I knew I was on for a real time. I did the math. 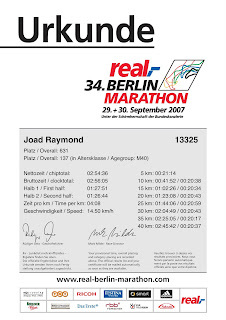 Keep at about a four-minute-kilometre pace and I might make 2:55. No I wouldn't, I'd ... I can't do math when my heart rate's at 200+ the 41st kilometre was surely the slowest. I think that was the wall. My legs were heavy, my pace drifted down, and focussing on my cadence didn't seem to make any difference. Then came the dawn. We turned into Unter den Linden, and ahead, less than 1,000 metres away, was the Brandenburg Gate. The body is in many ways its own master. After 40 kilometres it is really not interested in anything the mind may have to say. Sometimes it falls back, and sometimes it purrs forward, draining the tank. It went for draining the tank, pushing past another bunch of runners, all of us magnetised by the sight of the gate. 250 metres from the finish line one runner decided to stop me from passing him by shoving sideways into me as I did so, pressing me into the barrier ... I caught the kerb, almost toppled over the barrier, and only just kept my balance with my toes. No matter. I saw the finish and that was where I went in the mental dusk that is the end of a marathon. I'm not sure what that 100 metres between the Gate and the finish line were like. I think I was looking at the clock over the finish line. It was blinking towards 2:56. I was under the impression that I had crossed the start line about 90 seconds after the gun. I finished. The thought in my mind was, of course, that 2:55 had been sealed. But of course I did not know, because the dog ate my watch. I felt quite tired at that point. The legs seemed to be just about able to move forward, but the rest was nauseous. It took as much willpower as I had to head towards the finish area, despite the showers and masseuses. The medal was just fine, with a nice German-flag ribbon. I smiled for the photographers. One of the good things about being fairly quick is that you don't have to wait for the massage. It was very exciting to see the masseuse holding a bottle of arnica massage oil. I threw myself down on the bed and asked, "sprechen sie English?" She smiled and shook her head. "Italiano?" Blank look. "Francais?" She looked positively irritated at that point. I smiled and shrugged, figuring that it wasn't essential to our relationship. Next the showers. They were just great. The start had seemed somewhat chaotic. The usual problem with slower runners in front of faster runners; and new problems, such as the fact that the signs to the start disappeared half way there, hence the fact that Sean and I were almost late. This wasn't what one expected from German hosts. Surely it would run with the oiled precision of an Audi six series. Actually it didn't, but it was fabulous at the end, because the finish area was the same as the start area, so you knew where everything was, and there wasn't the London problem of your bags being transported 20 miles to some place that you really can't be bothered to walk to find ... the organisation was relaxed and admirably effective. And there was a nice big piece of grass, where we'd vaselined up beforehand (fortunately the nice security guard at Stansted decided not to confiscate my vaseline when I failed to put it in a zip-loc bag, thus causing all the sirens to go off at security). And it had been great before the start to see all the peoples of the world dropping their inhibitions and happy to pee into the hedges in the big piece of grass, regardless of nationality, gender or probable speed. The communal showers were big tents with beds at one end and hot water piping from the ceiling at the other. There was something faintly world war oneish about standing in the steam as emaciated men soaped themselves. Outside again: was that beer that the other finishers were drinking? Sure enough, I found the beer stall. I'd tried to mix my recovery drink with the water bottle I'd been given at the finish, unaware that it was carbonated. A good deal ended up over my tracksuit, so I thought I'd try a beer. Seldom has beer tasted so good. Clutching a beer I wandered back to the massage area. Now it was filling up. It was an open space (luckily no rain ...) with six rows of metal beds, about fifteen in a row. That's a lot of beds. On each lay one prone figure, and at the head of most were hunched one or two forlorn and physically drained figures, waiting for relief. It was strangely quiet. I though I'd walked into a hospital behind the trenches. I couldn't find Sean or Ian there, so I headed off to the Reichstag where we we had agreed to meet. By this point all the grey had drained from the world, and everything was rainbow coloured. The day had lost all of its sharp edges and all of its granularity. All of the pain had gone. It was just me and my beer and my two-forty-or-fifty-something. I checked my phone messages, but no one had told me what the something was. 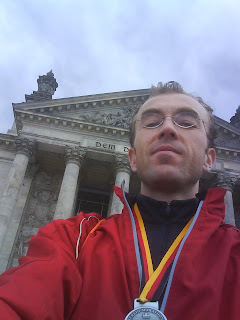 So I took a self-portrait in front of the Reichstag. Obviously my arms aren't long enough. 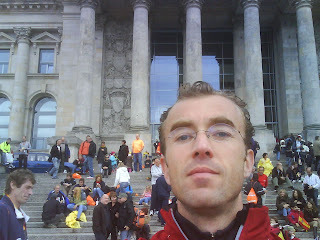 Sean and Ian were on the steps of the Reichstag. If you look carefully you can see them on the left-hand side, at the top of the stairs, Ian in fluorescent, and Sean in his new grey Sugoi water-resistant running jacket with reflective piping. Ian had taken nine minutes off his personal best, and gone under three hours. That's a huge shift. It may be the time it takes to make a good coffee, but in runners' terms that puts you in a different league. Does it get better than that? Does it get better than breaking (note the verb) three hours and slashing nine minutes off your Personal Best? Actually, it's only racing, and of course there are many things that are better than that, but it's not bad fare for a Sunday morning. Sean had - despite a distinctly self-indulgent summer in the south of France, his pursuit of Michelin stars, and despite his growing resemblance to Michelin Man - run another sub-3, a few second ahead of Ian. You'd think they would have had a sprint finish in the shadow of the Gate (metaphorical: the sky was overcast), but in fact they hadn't seen each other during the race, though they finished five seconds apart, because Ian had started a minute ahead. Sean was magnanimous about the breaking of his PB, and I could see in his eye an iron resolve to return the favour at his next race (Milan), at least until we made it to the bar. So that night we headed back to Berlin Shonefeld airport, they to Nottingham and I to Stansted, where Mercury was waiting for me. He'd thrown up in the back of the car. The following day I got the results. 2:54.36. Fifty minutes and ten seconds behind Haile (he's now 2-1 up in our head-to-head series, thanks to his failure to finish in London). Four minutes off PB. 631st finisher, 137 in age group (forty-something males). The 5k splits verged on the metronomic. Running eight 5ks and / or four 10ks is the future. It's now eight weeks to Milan. I was suckered into entering the Milan marathon when the entrance fee was dropped to €5 for previous competitors, and I found a £1.98 return flight. That was pretty foolish. Maybe I'll just treat it as tourism. I don't know where to go now, because I don't think I can do it much faster.